Kenneth Toomey is an eminent novelist of dubious talent; Don Carlo Campanati is a man of God, a shrewd manipulator who rises through the Vatican to become the architect of church revolution and a candidate for sainthood. These two men are linked not only by family ties but by a common understanding of mankind's frailties. In this epic masterpiece, Anthony Burgess plumbs the depths of the essence of power and the lengths men will go for it. A splendid tale of a story that never happened. This book about kindness, and the reflection of old men is enjoyable, brings a laugh, but has a melancholy tone that inspires genuine reflection. Your fictional narrator has the tone of a highly intelligent, educated man who feels no resentment towards those below him. Warm, endearing, and about the philosophy that really gets you through life. "It was the afternoon of my eighty-first birthday, and I was in bed with my catamite when Ali announced that the archbishop had come to see me." 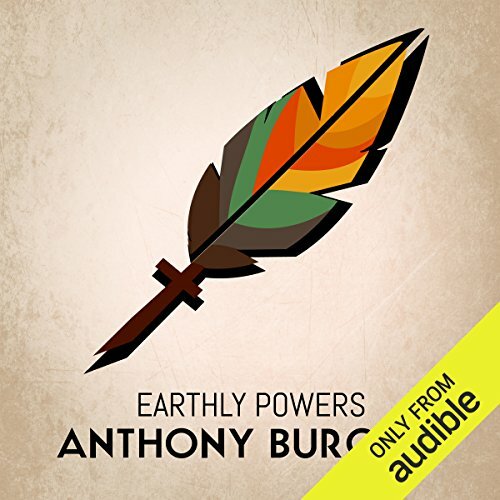 So begins Earthly Powers by Anthony Burgess. This line alone should be enough for most to decide if this book is for them or not. Burgess was a fan of James Joyce and a lover of words for their own sake as well as a means to tell a story. It portrays the life and times of Kenneth Toomey a gay writer across the span of the 20th century. It is a huge novel with many themes including the experience of being gay in that century particularly as a believer and how it changed over time, the problem of evil, the role of the catholic church. It requires a big investment of time and concentration but is well worth it. It is both funny and tragic and filled with vivid characters. If nothing else, you will join the ranks of those who can quote the opening line by heart. I didn't think anything could live up to the book. What did you love best about Earthly Powers? The story is incredible--the type of novel you live with for days/weeks, then want to call people with updates when it's over--only to remember that it was just you and the book. An Anthony Burgess masterpiece that's woefully unknown in the US. I didn't think any narration could do it justice, but Gordon Griffin not only meets but dramatically exceeds all expectations. I could not recommend this more. What other book might you compare Earthly Powers to and why? Almost impossible to compare it to anything. Your favorite Anthony Burgess novel. Your favorite movie. That television series to which you've become hopelessly addicted. Triple all my fawning adulation if you happen to be a fan of language. Have you listened to any of Gordon Griffin’s other performances before? How does this one compare? I haven't, and am combing his works to find something I might like, just to experience him some more. Can't beat that beginning sentence. I'm afraid the drool would clog your system. Just do it. Overall, I thoroughly enjoyed listening to Earthly Powers. Burgess writes beautifully and obviously relishes his mastery of the language. A very slight problem with listening rather than reading is that it's hard to look up words you don't know, and there were quite a few of those. One criticism I have of the book is that I didn't;t find the material about religion very interesting, and religion is a major topic. When the discussion is theological, it isn't especially novel. Whaat Burgess does best, I think, is descriptions of people and dialogue. The narrator is superb. I agree with reviewers who liken this novel to Delillo's Underground and other monumental reflections on life and particularly modern, global life. I will certainly reflect on this book for a long time. I found the narrator enjoyable when reading Caucasian male voices, especially British ones, but extremely off-putting when taking on the voice of a woman or non-Caucasian man. Nonetheless, a very worthy investment of time. I liked this story. It follows a boy through old age, and weaves a sweeping tale with the historical events of the 21st century as a backdrop. There's excellent development of characters. I read this when it was first published. Loved it then, maybe more so now.